UNIT9 is excited to present ‘I Am Not Me’, a solo exhibition of new sculpture by Piers Jackson (b.1970, Jamaica) curated by Rowena Chiu. 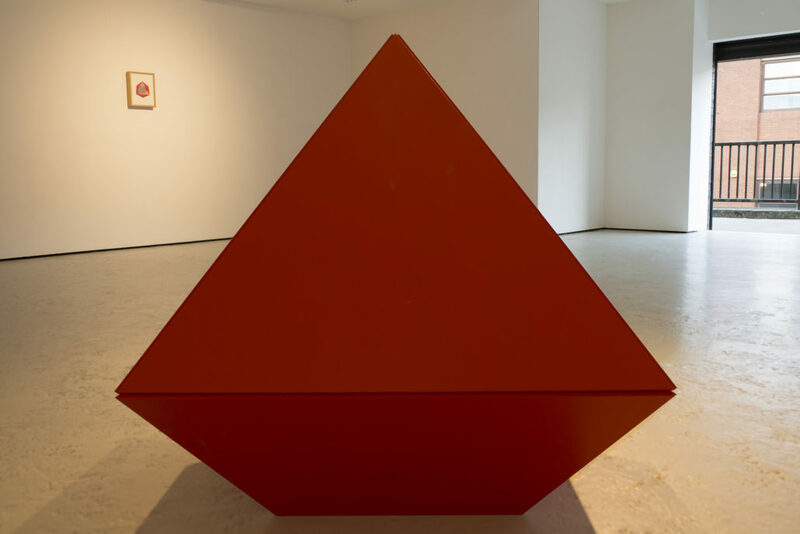 The show expands upon the artist’s ongoing explorations around sacred geometry and, in particular, Platonic solids. 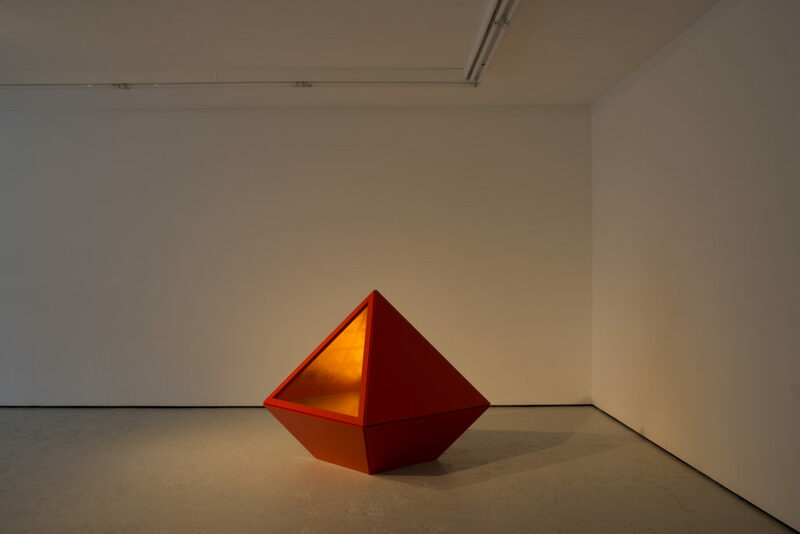 Taking the wall-based work titled ‘The Heart’ as its starting point, ‘I Am Not Me’ is an octahedral sculpture consisting of eight congruent, regular, convex polygonal faces. 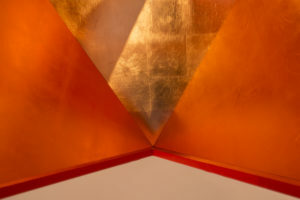 The work is painted with a vivid red exterior and gilded with a copper interior; red being the colour of vitality and copper being a metal associated with the goddess Venus that is also known for its conductivity. 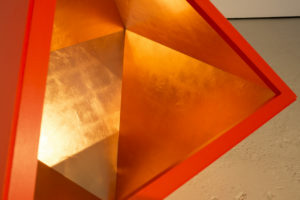 The sculpture appears to be missing the lower tip of the octahedron for it to stand erect on what would otherwise be a sharp point. 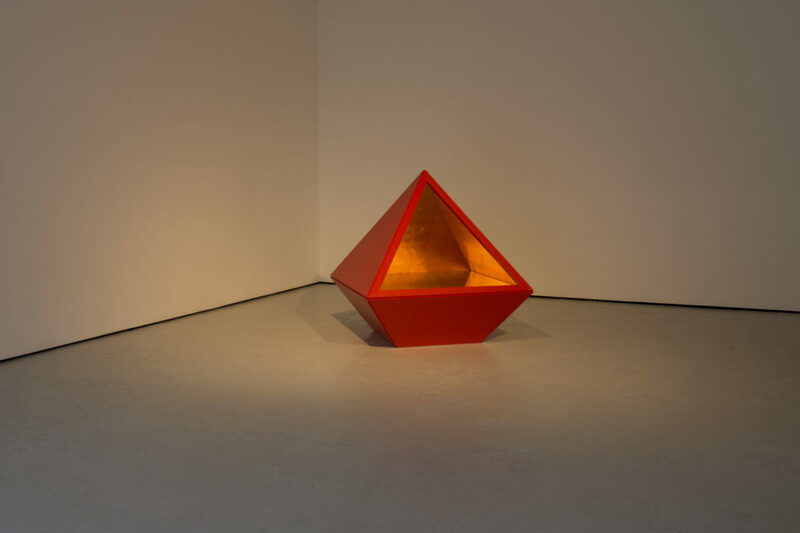 However, as the viewer approaches it, the interior view of the work reveals what appears to be its missing tip, implying that the work is not truncated, but in fact penetrates the surface of the gallery floor. 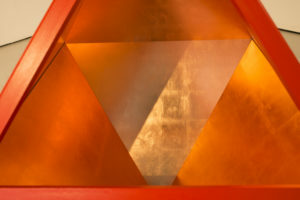 This sense of confusion is compounded by the realisation – upon closer inspection – that what appears to be the gilded base of the sculpture is, in fact, illusory: it is a mirror reflection of that which is above, below. The title of the piece comes from Jackson’s interest in the idea of the ego as distinguishable from the id (or in the case of this sculpture, the exterior view as distinguishable from the interior). Nestled in the corner of the gallery, ‘I Am Not Me’ is an intimately-scaled work that plays with the permeable boundaries between appearance, perception, perspective and reality. Installed across the gallery in dialogue with ‘I Am Not Me’ is ‘The Heart’, the work from which the sculpture was conceived. 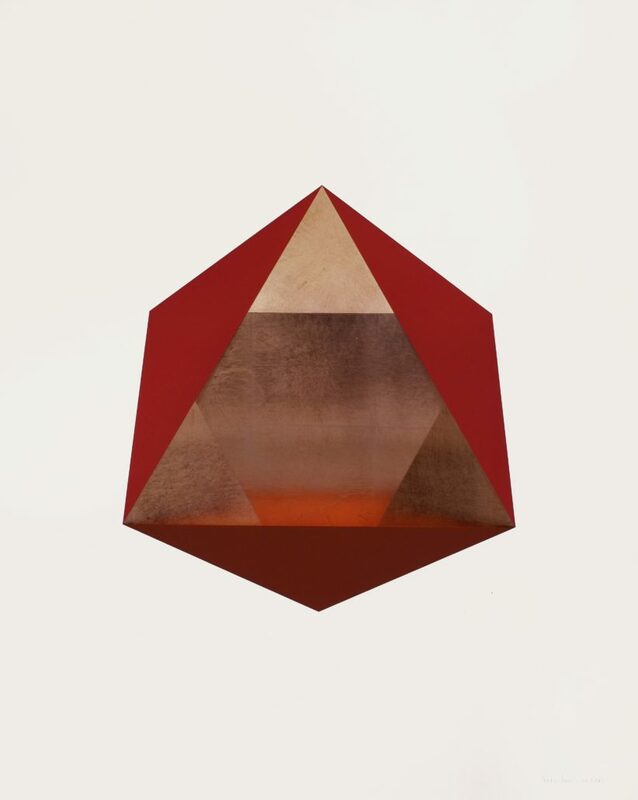 Piers Jackson’s works explore the aesthetic principles of pure mathematics and geometry. Using gold, copper or silver leaf exactingly applied by hand, his work marries form and philosophy to create meditative liminal spaces. Piers Jackson (b. 1970, Jamaica) lives and works in London. Solo exhibitions include: Encant Gallery, Menorca (2017); Serena Morton Gallery, London (2015); T1+2, London (2008) and Eyestorm, London (2005). Selected group exhibitions include ‘Beyond’ curated by Rowena Chiu, Unit 1 Gallery|Workshop, London (2017).